A better translation of the French title would have been Daughters of the Sun as these are clearly not girls but fierce fighting women who are as tough or tougher than any men. The narrative is built around the relationship between the two women, the soldier and the journalist. As we follow the women on their missions, there are periodic flashbacks to Bahar’s pre-war life and her harrowing experience as a captive. The two-track approach gives the audience insights on the kinds of appalling abuse heaped on these women by ISIS as well as their fierceness as fighters. 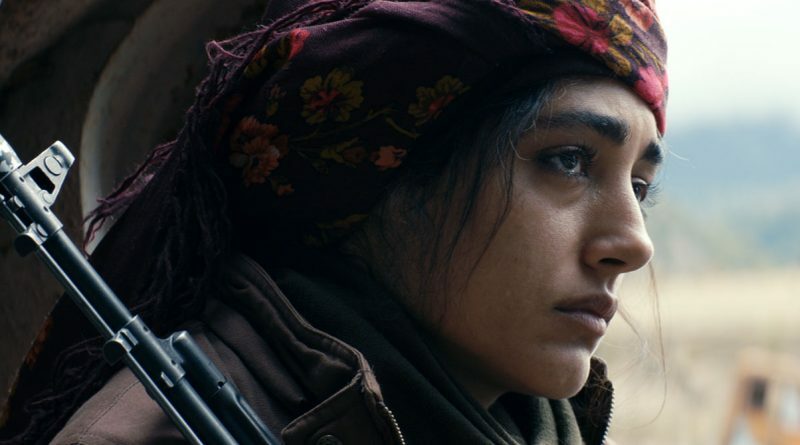 Golshifteh Farahani is remarkable as the leader of the women fighters, seeming to shift effortlessly from the cold, calculating soldier as she efficiently leads the military missions to a vulnerable woman haunted by the losses of the past. Her expressive face shifts from cold determination when carrying out a mission to tenderness soothing a dying young comrade. In quiet moments, she is a woman in pain, remembering her husband and son, whose names are tattooed on her arm. She is guarded at first with the Western journalist but as her respect for Mathilde grows, the two become close. Bercot does a fine job as the journalist but this is really Farahani’s film. Girls of the Sun is a powerful, unblinking drama about the horror of war, offering a unique female-centric view into a conflict that ravaged so many.